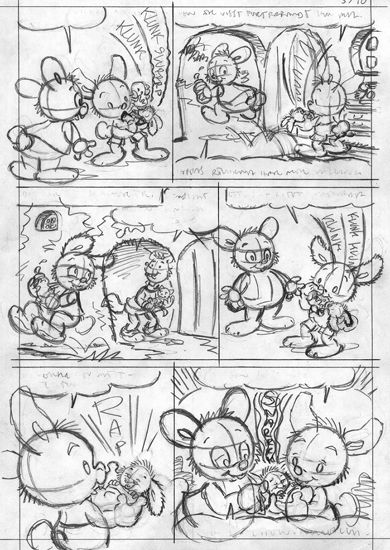 Lille Skutt’s brother Happ and his house mate Lille Sixten are back in a new adventure written by Susanne Adolfsson, introducing a brand new character in the Bamse universe. Great cover by Gunnarsson, Bällsten, Hanson and Jörgensen. 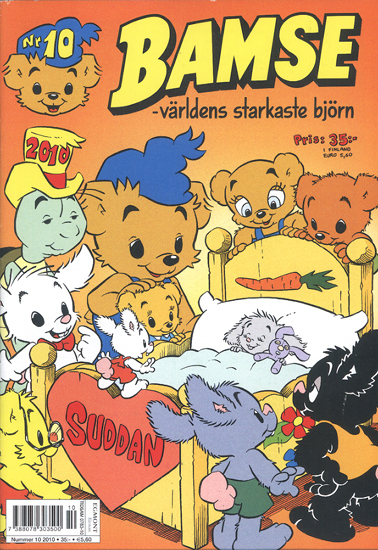 Happ and Sixten name the baby Suddan. 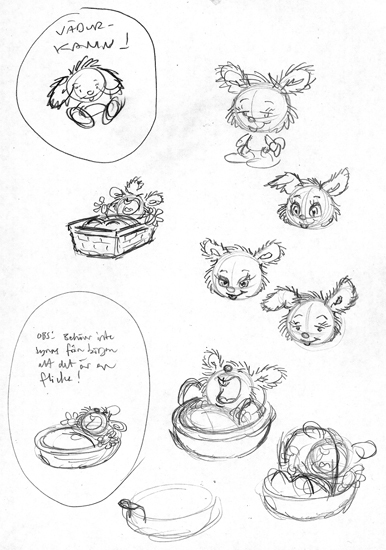 Here are some rough design sketches. I decided to make her a Lop Rabbit with hanging ears. I drew this comic about a year ago in Liverpool in my dad’s house. Brings back memories of a quiet summer, a damp Yemeni mafrash (living room) turned into a temporary studio, walking the dog, feeding the cat. The way it ended up in the magazine. 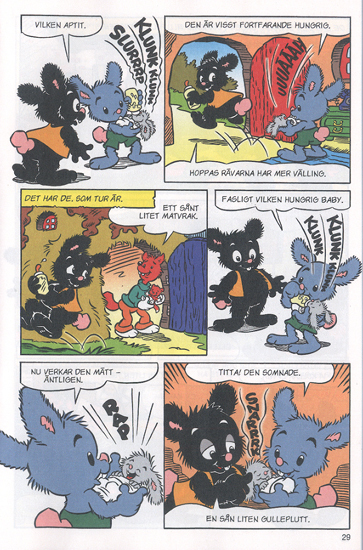 Happ, Lille Sixten och Suddan is one of those rare stories dealing with contemporary social issues in a way that in my opinion makes Bamse unique among children’s comics. Very nice work by writer Susanne Adolfsson. All images in this post are ⓒ Rune Andréasson. I had no idea it took THAT long before a story appeared in the magazine. Crazy. Hey, I was looking for your e-mail on the site but couldnt find it, I had a question regarding some of your older work for TL-klubben, so its not directly related to the topic of your current post. Yes, one year is a lot. Usually it’s like 6 months or so. I’m very happy to hear that you found a copy of TanimaL, and that you liked it. The other day my colleague saw a woman wearing a back pack with the Pling toy (the mouse) attached to it. 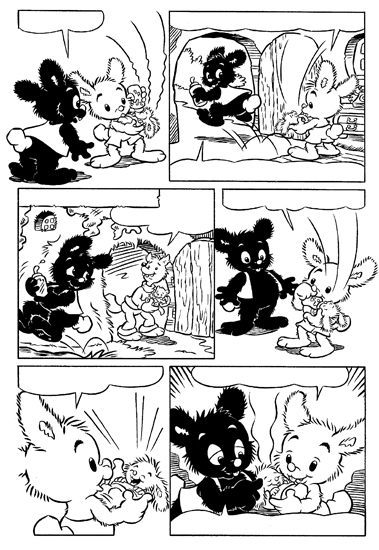 I enjoyed very much working with TanimaL, but it ended in a mess. The Swedish editor who was my main contact through the project was fired (or quit, I don’t remember) near the end, and the Norwegian editor rewrote the script after the pictures were done, resulting not so much in a different story, but in one where text and image didn’t match as well. To your question, yes it was the Swedish cover that they messed up. I got a few copies of the Norwegian one that you have, which looks a lot better. I would have spent more time on the cover, “cell shading” it and stuff, but I was a few days past deadline already and completely worked out after some intensive months. Anyway, it warmed my heart to hear some positive feedback from a neighbour and comics collector. Thanks!